If you've never played a Delicious game before, they're not particularly hard to grasp. Your goal is to try to get the highest star rating and reach any other objectives by serving customers each day when they come into the restaurant as promptly and accurately as possible. When a customer wants something as evidenced by it popping up over their head, click on the items before the counter to make the order, and then deliver them to the hungry person. If they're seated, they may take a while to eat and need the table cleared, but once they're done, click on the register to let them pay. If customers wait too long, they'll get impatient, and your score will decrease, so move quickly, and try to chain together actions of the same type, like letting multiple people pay in a row, to get bonuses. Keep an eye on menu items with numbers displayed next to them behind the counter, as they may need to be refilled, and don't dawdle with cold food... it might melt! As you go, you'll unlock different menu items, which you'll choose at the start of each level, and even upgrades for your restaurant to make things more efficient, or soothe the savage beasts that are your customers. 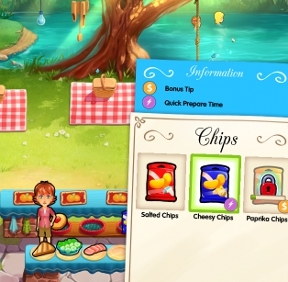 Most of this is going to be old news to longtime fans of the series, though the ability to choose your menu items to balance for your goals such as, say, food that can be prepared faster over some that grants a bigger tip, is a welcome addition. You still can't cancel actions, which can be a little maddening when things are hectic and you accidentally click on the wrong thing to send your server cheerfully traipsing off after it, and bonus objectives aren't always tied into the story the way they used to be in previous installments. The plot also feels a little lightweight, which is surprising given the heavier themes... there's just not as much dialogue to go around, and characters are more restrained, so that the goofy, lovable personalities are reined in. The series has always tended towards more comical drama, and it feels like in the effort to tell a more serious story, we've lost a bit of that effortless spark and addictive light that has always drawn us in. Which isn't to say Hopes & Fears is a bad game... far from it! It's as challenging and fast-paced as fans have come to expect, with restaurants in a variety of exotic locales, and the bar is set as high as ever with the game's beautiful presentation. It's just that, you know, watching a married couple scream at one another while their daughter hallucinates from a high fever is sort of less entertaining than watching a grown man in a tiny sailor hat have a meltdown at a preteen. 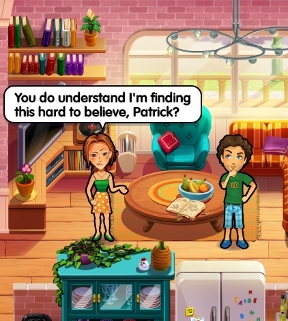 Still, Delicious: Emily's Hopes & Fears may be a little discordant in tone, but its gameplay is as rock-solid as ever. It's a textbook example of everything fans of time-management love about the genre... quick, clever, and challenging across its many levels and beautiful locations. Though it may look cute, it pulls no punches with its levels, and will keep you occupied with hours. The Delicious series is easily the reigning queen of the time-management genre, and while Emily's Hopes & Fears might be a little grimmer than you'd think, it's still got all the heart and drive behind it to make every moment you spend on it worthwhile.